"Three-Fingered Jack," the protagonist of this 1800 novel, is based on the escaped slave and Jamaican folk hero Jack Mansong, who was believed to have gained his strength from the Afro-Caribbean religion of obeah, or "obi." His story, told in an inventive mix of styles, is a rousing and sympathetic account of an individual's attempt to combat slavery while defending family honour. 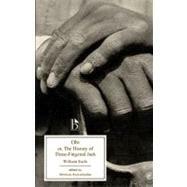 Historically significant for its portrayal of a slave rebellion and of the practice of obeah, Obi is also a fast-paced and lively novel, blending religion, politics, and romance.This Broadview edition includes a critical introduction and a selection of contemporary documents, including historical and literary treatments of obeah and accounts of an eighteenth-century slave rebellion. Srinivas Aravamudan teaches eighteenth-century literature and post-colonial studies at Duke University, where he is the director of the John Hope Franklin Humanities Institute. ""Three-Fingered Jack," the protagonist of this 1800 novel, is based on the escaped slave and Jamaican folk hero Jack Mansong, who was believed to have gained his strength from the Afro-Caribbean religion of obeah, or "obi." His story, told in an inventive mix of styles, is a rousing and sympathetic account of an individual's attempt to combat slavery while defending family honour. Historically significant for its portrayal of a slave rebellion and of the practice of obeah, Obi is a fast-paced and lively novel, blending religion, politics, and romance." "This Broadview edition includes a critical introduction and a selection of contemporary documents, including historical and literary treatments of obeah and accounts of an eighteenth-century slave rebellion." --BOOK JACKET.